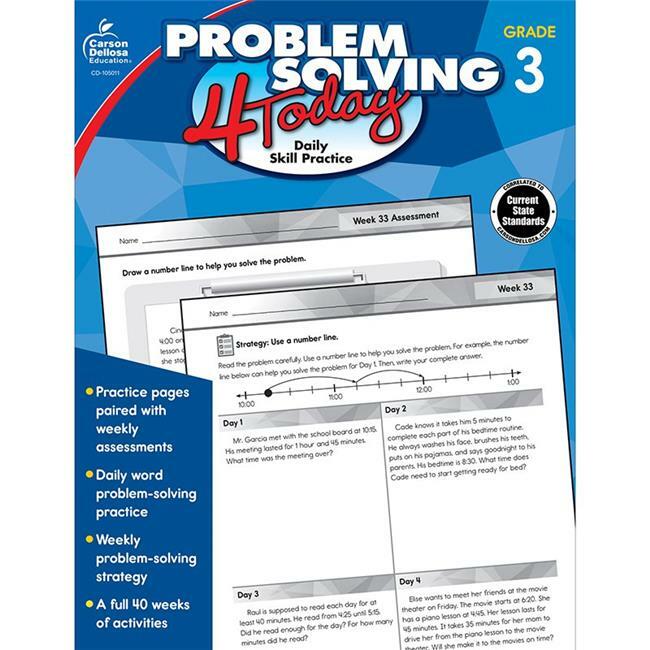 Problem Solving 4 Today: Daily Skill Practice for third grade contains reproducible activities designed to help students learn critical math word problem-solving skills with strategies such as restating the question, writing a number sentence, using a model, and more. The 4 Today series offers comprehensive, quick, and easy-to-use math workbooks. The reproducible activities review essential skills during a four-day period. On the fifth day, an assessment with related skills is provided. Each week begins with a Fluency Blast section to provide students with repeated, daily practice for essential skills. The format and style of the 4 Today books provide excellent practice for standardized tests. The series also includes a progress-tracking reproducible, a standards alignment chart, tips for fostering a school-to-home connection, and an answer key.